Writing Without Words was a project completed during the final year of my MA in Communication Design. The intention of the project was to explore methods of visually-representing text in order to highlight the similarities and differences in writing styles when comparing different authors. While I focused on 20th-century English-language authors, the main text I chose to work with was On the Road, by Jack Kerouac (a novel important to me when I was a teenager). Sentence length, themes, parts-of-speech, sentence rhythm, punctuation, and the underlying structure of the text formed the data that I then visualised. 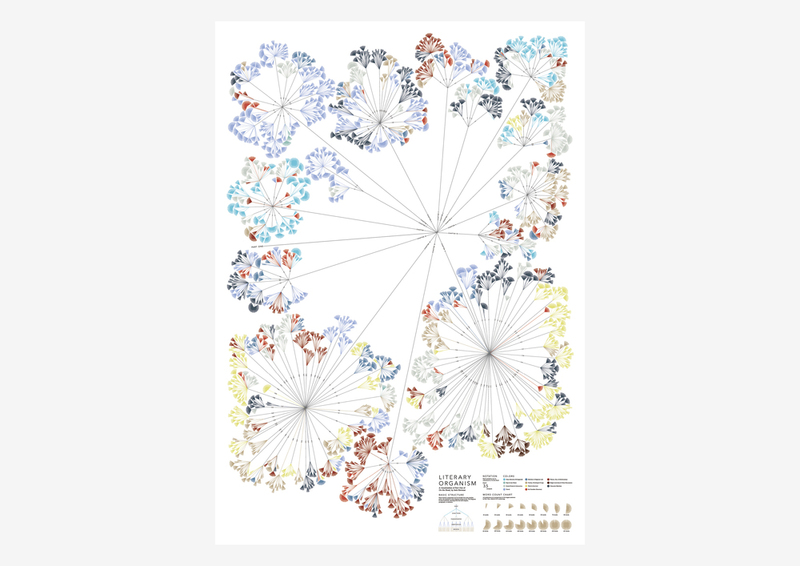 While the initial intention of this project was to create a straightforward data visualisation, in the end the project also became an exploration in how the process of data-gathering and data visualisation to know more closely a subject that one has an emotional connection with. 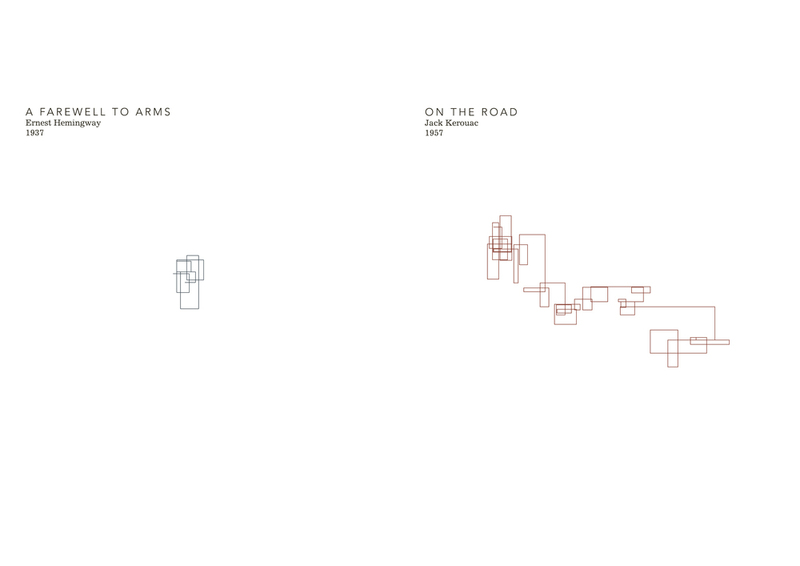 I created a series of A1- and A0-sized prints that applied the three visualisation approaches I was working with to the text of On the Road. The accompanying artist books (Two books, each an edition of 2) explain the visualisation approaches in more detail. This project was created in an analogue fashion, with data gathered by hand and the final visuals built 'by hand' using Adobe Illustrator. 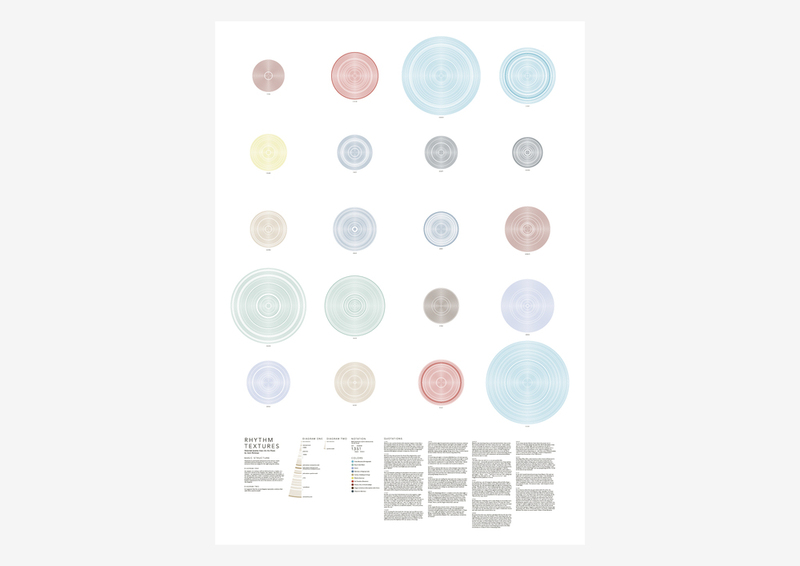 Shown below are artefacts from this handmade approach to visualising data. Writing Without Words is a project that uses various graphic approaches to analyse the structure and themes of On the Road by Jack Kerouac. When I began this project, I knew that while I was primarily focusing on the analysis of On the Road, I wanted to ensure my final methods of visual analysis could be applied consistently to any other literary work. By applying these approaches to different pieces of literature, visual comparisons of the writing styles of various authors could be made, and the complexity of the structure of their literary works could be highlighted. However, I knew I didn’t want to use expressive typography or imagery to create a subjective representation of the information. Instead, I wanted the graphics to be based on something quantifiable. However, searching for information that is constant in every piece of literature is difficult, what with the numerous themes, storylines, and words used in all of English-language literature. I realized I needed to gather data that related to the structure of English language instead of working with literary themes as a method of measurement. Using the sentence as the basis for my information visualizations meant I would be able to measure and map quantifiable information that could be found easily throughout the English language. So, gathering numerical data based on the structure of the novel and of a sentence seemed to be the most appropriate solution. I’ve always enjoyed using numerical data to create artwork because one can gather data from any topic and use it to generate graphics that help the viewer look at the subject differently. Also, the use of numerical data emphasises the hidden complexities inherent in the subject and brings them to the attention of the viewer. One method I used to gather data looked closely at the basic structure of the novel. I liked the idea of visualising the structure of a novel as a living, breathing thing full of energy and vitality, and this intent was the basis of my “Literary Organism” visualisation. Here, a tree structure is used to show how Part One of the novel is split into chapters, chapters are split into paragraphs, paragraphs are split into sentences, and sentences are split into words. The outcome is a cellular, plant-like structure. I sell unsigned, non-editioned prints of this project on-demand through Imagekind (based in the US). Click on the links below to be taken directly to the best configuration for each print (they automatically add framing to the price, so just remove this).